Due to some unexpected difficulties, I couldn't attend the 17th ESC in Southampton(UK), but I did two more important Dharma activities. 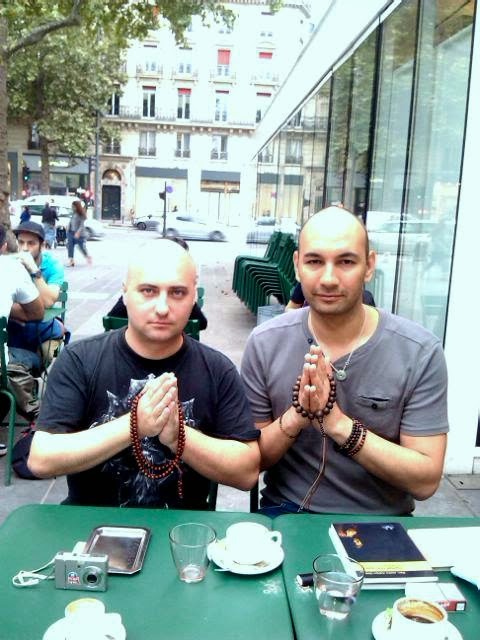 The first was a wonderful Dharma meeting with my nembutsu friend, Vincent, in Paris, to whom I donated many books for free distribution among nembutsu followers and people interested in Amida Dharma in France. The second was attending a meeting at Jikoji temple in Antwerp (Belgium) with Japanese representatives of Hongwanji. Here I presented a report of Dharma activities in Romania and informed them of the plan and progress in building Amida-ji temple. They were very excited about this project and firmly encouraged its continuation. During the discussions held at Jikoji with Japanese representatives of Hongwanji I also introduced the Dharma activities of my nembutsu friend Petros Theodoridis from Greece, who is now engaged in translation work and is trying to establish a dojo in his town. The books donated in Paris were soon replaced by other copies donated to me for Amida-ji library ( older translations of the sacred texts by Ryukoku University and new ones by Numata Center) by another great friend - Frits Bot from Holland, who was so kind as to accommodate me and my girlfriend Shushin at his home in Bergen op Zoom, and took us to Jikoji in Antwerp.